Light snow showers developed Saturday afternoon, causing some wet weather during the St. Patrick's Day Parade in Manhattan. There were no major accumulations as the snow tapered off by the evening. Conditions Saturday night should remain cloudy and cold. Sunday is expected to be sunny and chilly. A significant storm could be heading into the area Monday night and Tuesday. Expect heavy precipitation to start as snow and a wintry mix, especially north and west of New York City. The Snow will likely turn to rain Tuesday, with strong winds as well. Expect travel to be impacted by the wet weather. TODAY: Cloudy and chilly with afternoon rain/snow showers. 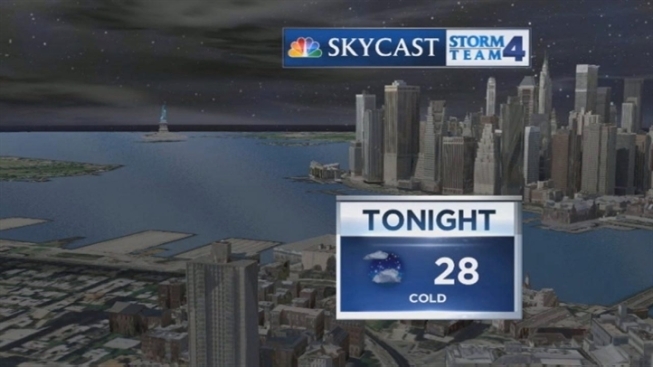 TONIGHT: Partly cloudy and cold. TOMORROW: Mostly sunny, breezy and cold. MONDAY: Increasing clouds with rain and a wintry mix at night. WEDNESDAY: Partly sunny, windy and chilly.